Rex Elementary School fourth grade twin sisters were the top winners in the annual Kansas DUI Impact Center’s annual poster contest. Katelyn Lamkins was awarded first place and a check for $100 and Annabelle Lamkins placed second and received a check for $75. Rex Elementary School fourth grade teachers Derrial Nichols (Katelyn’s classroom) and Jennilyn Sowersby (Annabelle’s classroom) each received a check for $50 to spend on their classrooms. As first place finisher, Katelyn’s poster will be will be reproduced for display on five large billboards throughout Wichita during the spring season – usually April thru June. Look for this winning poster on billboards around town courtesy of Davis-Moore Chrysler Dodge Jeep Ram and Kansas DUI Impact Center. 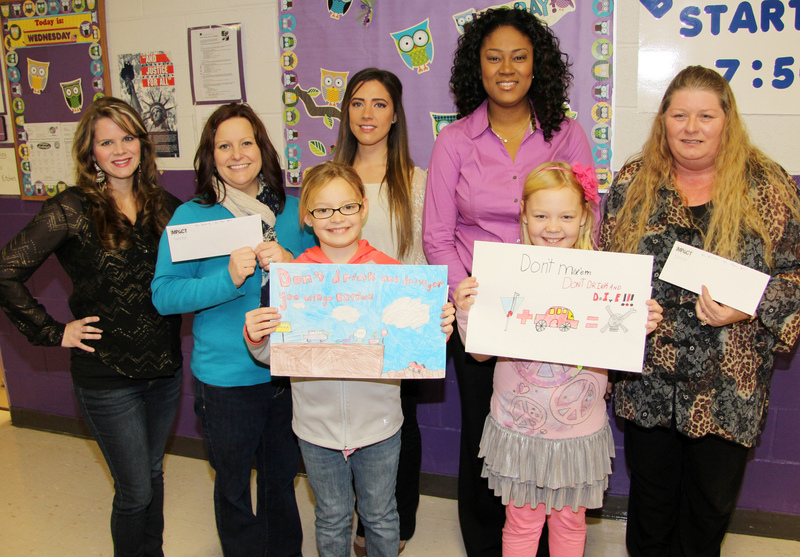 Representatives from the Kansas DUI Impact Center, Communities in Schools and Rex Elementary School were present when twins Katelyn and Annabelle Lamkins were awarded first and second place for their poster submissions. (Front row) Annabelle displayed her second place poster and Katelyn showed off her first place poster. (Back row) Representatives congratulating the twins were: Shaye Ferguson, Site Coordinator, Communities In Schools Rex Elementary School; Jennilyn Sowersby; Taryn Hall, Kansas DUI Impact Center Assistant Community Outreach Coordinator; Andrie Krahl, Kansas DUI Impact Center Director; and Derrial Nichols.